Established in 2010, Five9 has earned a large market share and trust from local and international business partners. Five9 Vietnam is a trusted partner and a recognized pioneer in telecom and software services. Established in 2010, Five9 has earned a large market share and trust from local and international business partners due to the high quality of technical foundation, understanding of the market’s potentials and needs. With the ambition of promoting the development of information technology in Vietnam and creating opportunities for Vietnamese engineers to reach beyond borders, Five9 Vietnam has been investing in software services, cloud software, Big Data and Artificial Intelligence solutions. Becoming the first choice for Cloud, Big Data and Artificial Intelligence services in Vietnam by investing in people and advanced technologies to provide business solutions that reduce operational costs and risks. Providing business solutions with the most effective and reasonable expenses that increase business performance of customers. To enable Vietnamese engineers to work up to their full capacity, Five9 provides a well-equipped, efficient, convenient working environment and narrows the gap between Vietnam information technology and the world. Products dedicated to solving real-world problems in everyday fields. Thursday that on August 16 IBM visited and had a strategic meeting with Chairman of Five9 Vietnam. Hanoi, 14th Nov 2017, Five9 brought to TECHFEST 2017 the new topic about “AI application in health-care”. 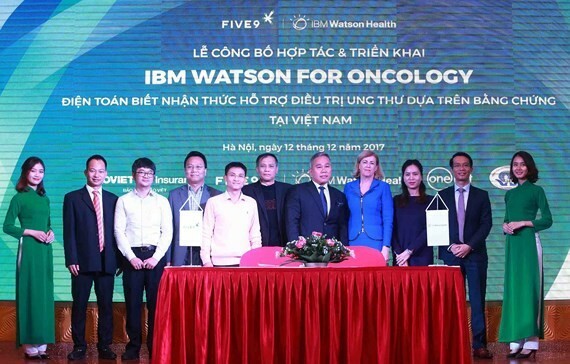 For the first time, Vietnamese entrepreneurs will access cloud-based cognitive systems that learn, reason and process natural languages. Juniper Research has calculated that mobile network operators can capture an additional $85 billion in revenues over the next five years through the deployment and enhancement of non-core services. A growing number of lucrative deals in high ARPU verticals, such as the connected car, will significantly increase revenues for operators able to capture those markets. Telenor is rolling out Google’s Rich Communication Services (RCS) to customers in Europe and Asia, which it hopes will succeed SMS. It’s been a long time coming, but the abolition of roaming fees across the EU is due to come into effect by mid-June. Worldwide IT spending is projected to total $3.5 trillion in 2017, a 2.7% increase from 2016, according to the latest market study by Gartner. Straight Path Communications has reached a comprehensive settlement with the FCC related to the company’s wireless spectrum licenses, the company has announced. Qualcomm has commissioned a landmark study called 'The 5G Economy' which investigates the economic and social impact which 5G technology will have around the world. Cisco is the most familiar company in the router and switch market with Juniper and Nokia trailing behind, according to a new piece of research from IHS Markit. According to clinicians, healthcare in rural areas is suffering due to inadequate broadband connectivity in regional and rural areas. Under a new anti-piracy initiative, UK ISPs will send emails to subscribers caught downloading and sharing copyrighted material. The Internet of Things and the manufacturing sector are destined to collide, as more companies with factories explore the benefits of new technologies. Following the London terror attack, Microsoft provided information to police within 30 minutes of the company receiving a legal request.